A 527 political organization named “Protecting Colorado Values” has made at least one recent local TV ad buy that will attempt to influence the vote in the Republican gubernatorial primary. However, the filing agent for “Protecting Colorado Values” has lengthy and strong ties to Democrat operations. …The designated filing agent for “Protecting Colorado Values” is Julie Wells, a person who has served as the “registered agent” for dozens and dozens of Democratic leaning organizations in recent years. Much like Hickenlooper’s record as Governor, the rhetoric and nonplussed façade of his campaign doesn’t match up with their actions. His four years as Colorado’s Governor has left him with a far-left record he can’t run from this election. Anti-guns, anti-rural Coloradans, anti-justice (Dunlap), anti-puppies (unconfirmed); you name a thing that makes Colorado great, and most likely Hickenlooper has opposed it. Only his ability to drink beer and hold baby goats has distracted the media from covering it. 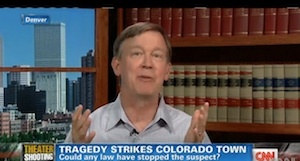 Unfortunately for Hick, election season will lay his record bare for all Coloradans to see. Colorado Democrats also know Hickenlooper pretty much received a free pass in his first election as Governor. The skeletons in his closet remained there, as the race was already hopelessly lost when Dan Maes (?- Incompetent) won the nomination for the GOP. This time around, Hickenlooper won’t be as fortunate as any of the remaining Republican candidates have demonstrated they have the ability to take the fight to Hick. That being said, Hickenlooper and Colorado Democrats must feel one of them is more imminently beatable than the others, and will try to subtly push Republicans that way. It’s like the scene from The Godfather where Vito Corleone tells Michael whichever friend approaches Michael after Vito’s death will be the one who betrayed him. Well PeakNation™, watch for it, whoever these Democrats seem to be attacking the most in this upcoming ad, just might be the very ones they want to face. Now, what we choose to do with that knowledge may be the difference between winning or losing come November. Here’s hoping we’re more Michael than Fredo. These ads are not about the primary. They are targeting the most likely Hick opponents in the general.